This Christmas, It's All About Puppy Love! 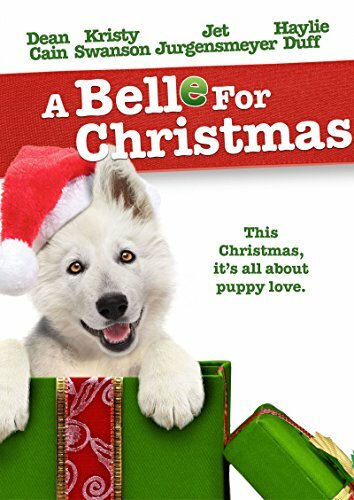 LOS ANGELES, CA - August 4, 2014 - Just in time for the holidays, Anchor Bay Entertainment brings home A Belle for Christmas , an uplifting comedy about family, friendship and a four-legged holiday miracle. The film, starring Dean Cain (The Dog Who Saved the Holidays, "Lois & Clark: The New Adventures of Superman"), Kristy Swanson (Big Daddy, Buffy the Vampire Slayer), Jet Jurgensmeyer (The Little Rascals Save the Day), and Haylie Duff (Material Girls,), will be making it's national retail debut on November 4, 2014. A Belle for Christmas is priced to own at $19.98 SRP. Dean Cain stars as Glenn Barrows, a recent widower doing his best to raise his young kids Elliot (Jet Jurgensmeyer) and Phoebe (Meyrick Murphy) who really miss their mom. When the Barrows adopt an adorable puppy named Belle during the holiday season, it seems that their healing may have begun. But will Glen's dog-hating, gold-digging new girlfriend (Kristy Swanson) spoil their newfound happiness, or can Elliott and Phoebe pull off a daring Christmas Eve rescue of their beloved new pet? Haylie Duff co-stars in this fun-filled furry family comedy that will warm hearts just in time for the holidays. Anchor Bay Entertainment is a leading home entertainment company. Anchor Bay acquires and distributes feature films, original television programming, including STARZ Original series, children's entertainment, anime (Manga Entertainment), fitness (Anchor Bay Fitness), sports, and other filmed entertainment on DVD and Blu-ray(TM) formats. The company has long term distribution agreements in place for select programming with AMC Networks, RADiUS, and The Weinstein Company. Headquartered in Beverly Hills, CA, Anchor Bay Entertainment has offices in Troy, MI, as well as Canada, the United Kingdom and Australia. Anchor Bay Entertainment (www.anchorbayentertainment.com) is a Starz (NASDAQ: STRZA, STRZB) business, www.starz.com.